A fusion of iTunes and Last.fm: can Mendeley change the face of science? AAA is not a new concept to those who read our blog, nor our tireless efforts to increase the availability of and access to our research. Just today here in Cali, at the CIAT campus I have been discussing a paper written by our colleague Edith Hesse about CIAT’s efforts to increase the availability and accessibility of their research, following our joint efforts to introduce web 2.0 tools in the CIAT science week. And it was only yesterday that I got to know Mendeley, the latest innovation to organize, discover and share scientific papers. It goes to show how fast things move in this area. What is Mendeley? Apart from a great demonstration of how innovation in one area (music) can move to another (scientific publications)? To understand Mendeley you need to know how Last.fm works. It is a radio channel on the web where users can listen to their own songs and other tracks recommended by Last.fm’s algorithms based on their tastes, including iTunes, and those of friends. Think to apply the same principles to scientific research. “Why can’t researchers, instead of waiting anywhere up to three years for their papers to jump all the hurdles, be part of a real-time market place – a fusion of iTunes and Last.fm for science? ” wonders Viktor Keegan . So meet Mendeley: a databank of scientific articles built using Last.fm’s principles of recommending music, videos and concerts based on what you listen to. It looks like some of the large archives, such as ArXiv’s, efforts, with its half a million e-papers free online – will soon pale in comparison to the potential of Mendeley. The growth rate of Mendeley is impressive, over 4 million scientific papers have already been uploaded in a matter of weeks. If you think that the largest academic databases host about 20 million papers, you will see what I mean. Is Mendeley also a rival for Google? The real innovation with Mendeley is that it does not limit itself to links to a website, but links like-minded people. Could this be a way to change the face of science? Shall CGIAR researchers give it a serious try? Could this be a real breakthrough to ensure our researchers stay easily connected and their results easily get to the hands of those who need it? Technology continues to change; the way we collaborate with others has changed; and the way the CGIAR conducts its business is currently undergoing radical change. With the present air of change that is permeating the entire System, it was inevitable that CGXchange would, sooner or later, have to answer the call for a portal that meets current needs. As such, CGXchange’s intranet concept has been exchanged, so to speak, for a dual-concept application that satisfies both the need for public content and the need for ‘private’ collaboration spaces. Last month, we introduced the new, improved CGXchange 2.0, a platform based on Google Apps that satisfies our current needs by facilitating online collaboration and exchange both inside and outside the CGIAR. “Why Google Apps?” you might ask. Well, with a highly decentralized set up like that of the CGIAR, over 8,000 staff in 120 offices, mostly in countries where connectivity is a challenge, and with a dire need to collaborate with colleagues and partners, we are always on the look out for solutions that simplify our work. So last year, we tried out Google Apps as a suite of collaboration tools and were suitably impressed. You can read the results of our experiments in the CGIAR Google Apps report. A few months later, during the first half of March 2009, a selected group of testers evaluated a beta version of the site. The summary report of the test results is just out on CGX 2.0: tried, tested and passed with flying colors! We have included our replies to the comments and questions from the test participants. Public content: the tutorials, guides, links to useful resources, outcomes of our tests are open to anyone who wants to learn how non-profit institutions such as the CGIAR are taking advantage of online tools for improving communication, sharing and collaboration. Openness is our main driving principle: while CGIAR staff benefits from the availability of the Google Apps collaboration tools, then anyone with a Google account can be invited to collaborate and view the information CGIAR staff will create with Google Apps. Freedom of choice is our other driving principle: we aim to inform you and show you the possibilities that the Web offers to share knowledge and collaborate more efficiently online. The available tools can be safely used for closed and/or geographically distributed groups. We can guide you through the tools available, but you will make the final decision as to what is best for you. We walk the talk and share the lessons by doing our best to test the tools in our context and share the circumstances in which they proved to be suitable and useful and referring to more than two years’ experience with the ICT-KM Program’s Knowledge Sharing projects. “What do I do now?”, you might, again, ask. These include the conference synopsis and two background papers. Two briefs are undergoing final edits, and the book will be finished in 2009. This synopsis is based on a consultative conference held in Addis Ababa, Ethiopia, in April 2008. IFPRI gratefully acknowledges the contributions of the German Agency for Technical Cooperation (GTZ) http://www.gtz.de, the ICT-KM program of the CGIAR www.ictkm.cgiar.org, the Japan International Cooperation Agency (JICA) http://www.jica.go.jp, Research Into Use (RIU) http://www.researchintouse.com, the Technical Centre for Agricultural and Rural Cooperation (CTA) http://www.cta.int, and the World Food Programme (WFP) http://www.wfp.org. 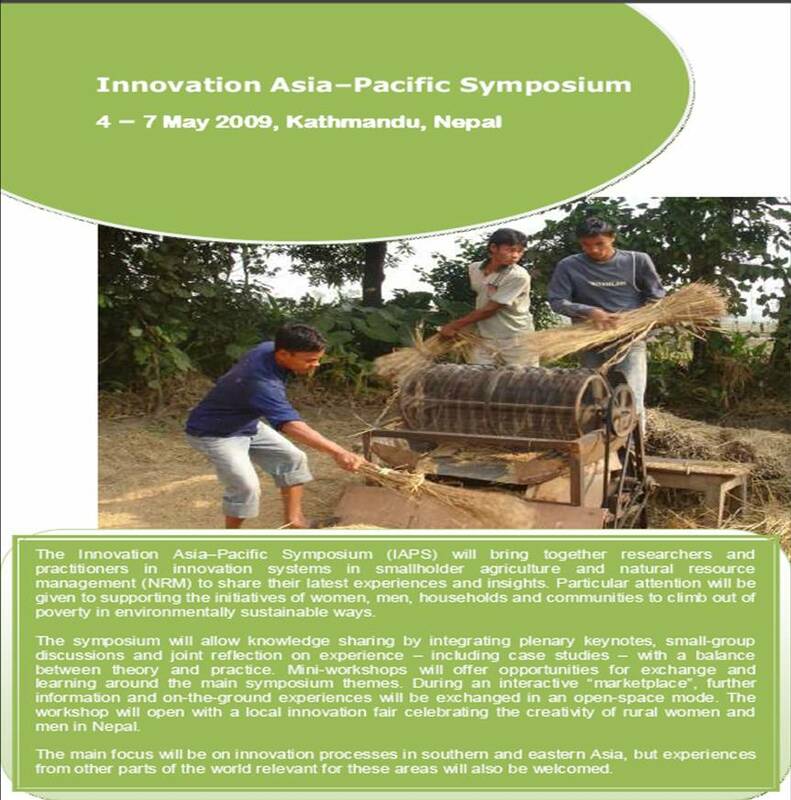 The Innovation Asia-Pacific Symposium will take place from 4 to 7 May 2009 in Katmandu, Nepal. 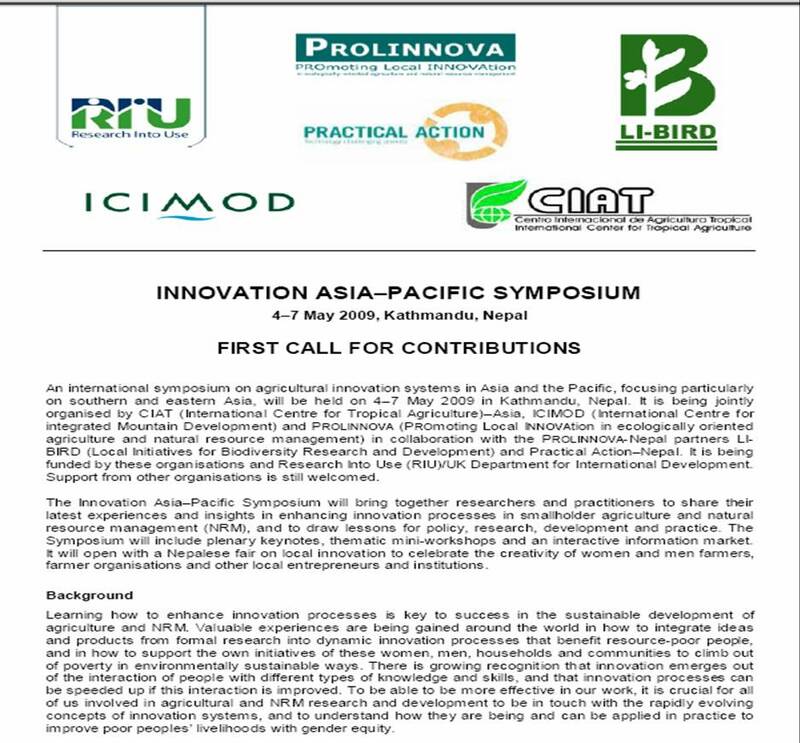 PROLINNOVA is co-organising this symposium with ICIMOD (International Center for Integrated Mountain Dveelopment) and CIAT Asia. PROLINNOVA partners in Nepal – LI-BIRD and Practical Action are playing a leading role in all the activities leading up to the symposium. RIU has already committed itself to financially support the symposium and several other donors are considering funding. Please feel free to pass this on to other interested individuals and organizations. More information is found on the website www.innovation-asia-pacific.net Closing date for submission of abstracts is 20 December 2008. The organisers hope that this symposium will be as successful as the Innovation Africa Symposium that was co-organised in Uganda in November 2006 and contribute to promoting local innovation and innovations systems in agriculture and NRM. 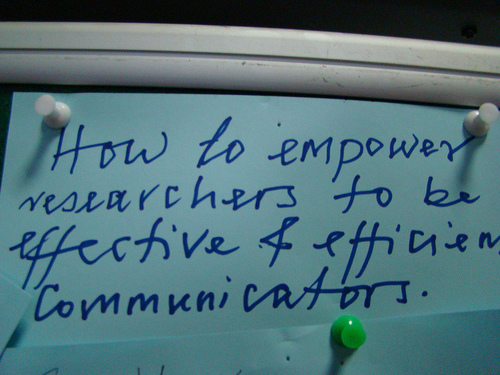 Stories from the Addis workshop: how to empower our researchers? How to improve our impact? On 21st October we alerted you on the workshop to be held in Addis Ababa on how communication can help improve the impact of agriculture research. The ICT-KM program was one of the organizers of the event. Yesterday I attended seminar on ILRI Addis campus given by two senior researchers: Berhanu and Ananda- on the topic of how to integrate Value Chain Analysis and Agricultural Innovation Systems approaches in order to move forward and achieve an agenda for research for development. This was an interesting seminar which sparked many questions and discussions between the presenters and the many CGIAR staff members present. Of interest to the Knowledge Sharing in Research project was the highlighting of one of the main differences in the innovation systems perspective as compared to earlier theories and approaches to research. As the presenters pointed out, the main thrust for research has always been knowledge creation and generation- which they entitled INVENTION–coming up with solutions. But INNOVATIONS or changes, as different from an INVENTION, only happen when knowledge and technology is used or applied to achieve social and economic benefit. It has therefore been recognised that knowledge is only one component necessary for bringing about an innovation as the ultimate goal, and that interaction and learning amongst a number of key actors is also required. While many agree with the theoretical and intellectual underpinnings to this framework and agree with the propositions it makes, there is still a looming question about how this new type of approach can be operationalised. “What does it actually look like?” asked one person attending the seminar, “What activities does it include? how can I realistically introduce it and use it in my research program?”. The practical approaches to how to collaborate, learn together, and share knowledge with various actors is what is missing from this still conceptual discussion. Quite often the innovation systems approach seems to be quite big, all-encompassing–leading to failure from trying to make such a big leap. One reason for failure to adopt or successfully use an Innovation Systems approach in agricultural research may be because it requires such big changes in approach that research organizations are unable to support due to lack of skills to carry it out, it being heavily time-consuming and expensive, it is a complex approach, and it involves many more activities than research organisations can or feel that they should be carrying out themselves. What the Knowledge Sharing in Research project brings to this particular table is a set of options for how to undertake activities to achieve such objectives put forward for necessary improvements in research processes to enable it to contribute more to development outcomes. These may be small-scale approaches or frameworks which can be integrated into the research process/cycle itself to improve it along the lines which the Innovation Systems calls for. These are innovations at various stages in the research process which help us to improve our imapct by making efforts to complete the chain of effective knowledge generation, dissemination, adaptation and utilization. *Try some alternative, participatory monitoring evaluation and imapct assessment approaches which involve stakeholders in the process and focus on additional aspects of behavioral change, network relationships and stakeholder needs and perspectives, such as Outcome Mapping and Most Significant Change–like the WorldFish Pilot is trying–and perhaps develop an approach which fits your own project context and needs. ..and more options and examples! Perhaps we can still achieve the same objectives and reach the same end goal called for in the Innovation Systems movement but by integrating some (small) approaches which are manageable into our research process to make step-wise changes and improvements rather than having to make big leaps which cannot be easily supported. This in itself can be an innovation for our own research for development processes. “IFPRI’s call to shake-up research” is the name of the article in the most recent edition of the New Agriculturalist magazine highlighting the recently held ‘Advancing Agriculture in Developing countries through Knowledge and Innovation conference’, by IFPRI in Addis Ababa, Ethiopia in April 2008. The conference, as seen by the New Agriculturalist was part of ‘the International Food Policy Research Institute (IFPRI) now joining the growing chorus‘ on necessary changes in agricultural research by ‘issuing its own “roadmap” for development, which champions the importance of innovation and the pressing need to make scientific research relevant to farmers‘. The topic of the event is closely aligned with the principles embodied in the ICT-KM program and its interventions. The ICT-KM is trying to support the “focus on changing systems” by Centres such as IFPRI and the CGIAR as a whole through learning about, sharing knowledge, providing technology and giving support in the types of tools, technologies, approaches, and systemic changes which can bring about and support such changes. The ICT-KM program through the Knowledge Sharing in Research project provided funds to support this important event. In addition Enrica Porcari-CGIAR CIO and Leader of the ICT-KM program- represented the program at the event, gave a presentation on ICT-KM interventions, and chaired a session. The ICT-KM interventions presented will be featured in a chapter of the book which will be coming out of the Conference.